If you’re a long-time reader of the site, you’ll probably know that we’ve spent a decent chunk of time talking about Labo VR already when we got a chance to have a go with it at Nintendo UK’s headquarters. But now we actually own the blooming thing and have spent more time than we’d deem healthy having a good old rummage with it, so what are our thoughts and feelings about all this new cardboard gubbins now? Building-wise, it’s still Labo. There’s nothing extraordinarily different about it compared to any of the other kits, the instructions are as clear as ever, and all in all, there’s nothing to really say about it that hasn’t already been said numerous times about other kits – so let’s just move on to the games, shall we? This kit comes with the VR goggles, four main Toy-Con, and a couple of other little twiddly bits to go with them. Unsurprisingly, the VR goggles are the undeniable star of the show, and the gateway you’ll need for all the Toy-Con to be even remotely useable. However, if you like the look of the games but you’re not able to enjoy VR properly for whatever reason, you might have more luck with the included holder designed to replace the goggles. This simply holds the Switch in place and is a really nice touch for anyone who is unable to (or just doesn’t want to) use VR. For the most part, the games are similar to what we’ve seen with previous kits; they’re fun and entertaining to begin with, but lack longevity or sense of replayability. 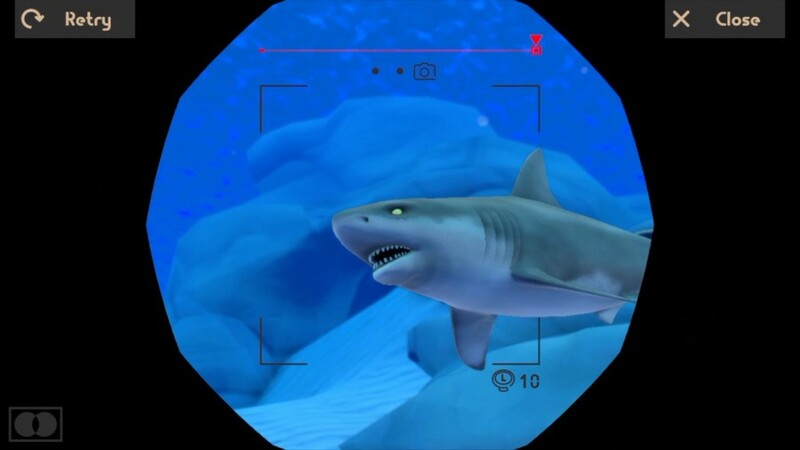 The Toy-Con Camera, for example, has you simply taking pictures inside the Toy-Con House from the Variety Kit, or the underwater depths also found in the same kit. 90% of the assets are recycled, and whilst it’s fun, it’s a bit underwhelming. The Elephant comes with both a game and an art studio. 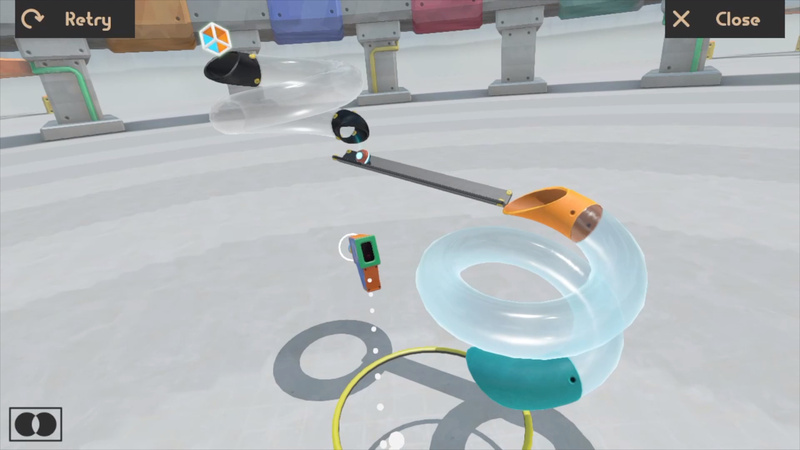 The game tasks you with guiding a ball through a simple Rube Goldberg-style mechanism to an end goal, grabbing and holding different rails, tubes, and other shapes in order to do so. It’s good fun, but we found ourselves wanting to analyse the contraption from other angles, and move our bodies physically closer so we could see things more clearly, but as you’re rooted to the spot, this isn’t possible. The same goes twofold for the art studio, which allows you to create objects in 3D space, but again allows no movement of yourself in this world, meaning your artwork may look good from the front, but bizarre from another angle due to your inability to be able to manoeuvre around it. It’s a shame, as there’s a great deal of potential here, but it falls just short of what we’d like. However the same absolutely cannot be said for the Toy-Con Blaster games. 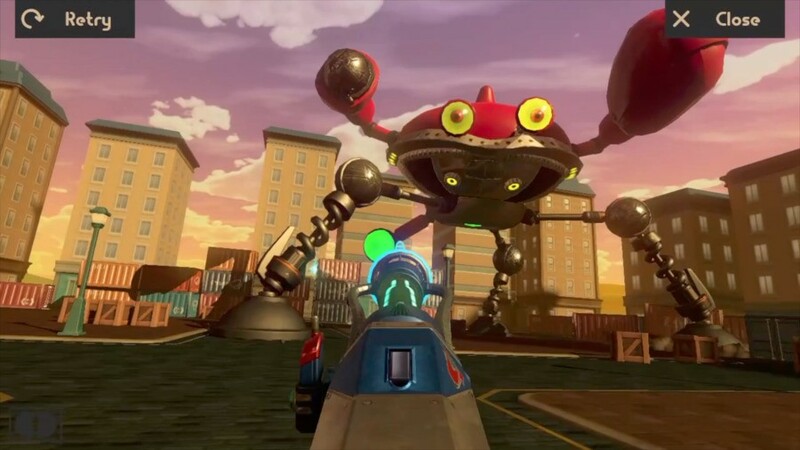 The Blaster is absolutely the best time we’ve had with any of the VR Toy-Con, and even though it was the one we’d spent all our time with at the preview session, it still kept us coming back more than all the others combined. The slow movement of your character in the on-rails shooter game is just enough to keep the pace strong, but without being too unforgiving and giving you motion sickness, and the draw of high scores kept us invested for a long time. The same goes for the multiplayer Blaster game, Kablasta. This pits you against another player to encourage Hippos into your section of the pond by blasting fruit into their mouths (of course), and employs surprisingly deep tactics that aren’t immediately apparent when you first jump in. As fun as it is, it does, however, raise an issue with the communal focus of the VR Kit. The game encourages multiple people to get in on the action as much as possible, but due to the closed-off nature of VR in general and the lack of the ability to display what you’re seeing onto the TV, anyone who’s not playing the game feels disappointedly cut off. This is most noticeable when a Toy-Con has been first built, and naturally, you’re going to want to play with it straight away. If you’ve built it with someone else then one of you is going to be sat there twiddling your thumbs not only waiting for your go, but hearing the other person having a blast whilst simultaneously having no idea what they can see. There’s no simple solution to this, but even so, it can feel as though the other person is hogging the game, even though there’s no way for them not to do so. But all of this is only one half of the software-based coin, and arguably the most potential comes in the VR Garage section of the game. 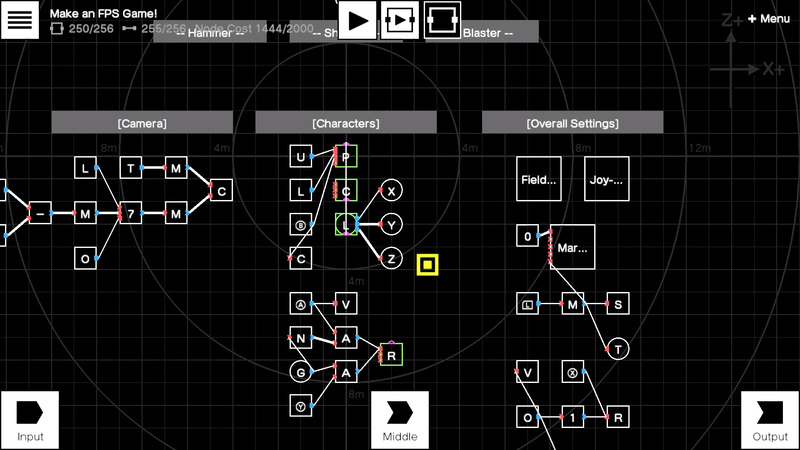 This allows you to create your own games with a staggering amount of flexibility and potential. Indeed, it was completely overwhelming when we first had a look at how one of their example games worked, and even simple things like camera movement proved to be obtuse at first. Thankfully the game helps everyone out with the charming and excellently accessible tutorials that take you through how things work, and whilst they may only provide a foundation of understanding, it’s a chuffing solid one. We’re keen to get even deeper into the nitty-gritty of what this kit can offer, and whilst some of the Toy-Con feel a little underutilised, the core experience is a good one, and probably the most robust to date. The VR is solid despite the system’s limitations, and the prospect of the VR Garage’s baffling depth and potential is leaving us eager to get even further into making our own Switch games. It certainly seems like the VR Starter kit, which has just the VR goggles and blaster for half the price of the full kit, is the way to go if you want to dive into this at all. Also, the video is "unavailable"
Hey NL, go and review Hellblade already: it's the best port! Even better than Doom, right now it's the most beautiful game on Switch. Panic Button is no longer the King of Port. Given this second hands on time, how will the BotW and Mario implementation work? How does it being held with straps instead of hands feel? Hellblade ist jut a walking simulator with nothing to do than walking and listening. There´s no challenge to port the graphics over when you don´t have to care about anything else. Panic Button actually can also port the gameplay, not just the graphics. @EasyDaRon I can't tell if you're trolling or not, but Hellblade has more than just walking. There is combat to the game that can, at times, get a little intense. We aren't talking Bayonetta level of fast-paced combat, but it does have all the elements of a third-person action title - combos, dodging, blocking, countering, etc. Walking simulator it is not. @AlexOlney They sent a review kit on condition you don't review it?! @NintendoFan4Lyf Pssst, Ron has never played it. @kenjab Planning on getting the starter kit, wondering how the other kits work since it says on the page they are just cardboard, not the game. I would think they would come with a DLC code but if they are really just cardboard can't we just fake it? Thought we might get the elephant and camera kit but this review has put me off both of those. Bird and pedal never really interested me. I´ve played it on PS4 and got bored after a few hours. Compared to previous Ninja Theory-titles (which I loved), Hellblade is a complete letdown. You walk around in very static environments and scripted scenes most of the time, listening to the complaints of the lady. And yes, a few times you can fight with a simplistic, but still okayish combat system. So is it really VR, like the PSVR gives you? Does it have depth, does it make you feel like you're in the game? Or is it just a large 3D experience? No ones mentioned this yet in their "hands-on" experiences. It seemed to be avoided so I'm guessing its not really VR like the others. @MattyHammo About 9 minutes into the vid Alex says it's not like being there, it's like looking through a magic window. I haven't tried it, but after a few years of trying out those phone headsets which are kind of cool but that's about it, I had a chance to try out PSVR. Then I spent $200 to buy a PSVR headset. 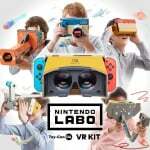 I think the consensus on Labo VR, among those of us who haven't used it, is that it will be closer to a phone, further from PSVR, Occulus or Hive. I've also tried Hive at a friend's house and that takes PSVR up a notch. It's possible people who have only used phones, or no VR at all, will think this is real VR, but people who have used better VR will think it's garbage. I also think people who have played Face Raiders on 3DS will get a sense of deja vu. Will be spending most of the weekend assembling cardboard with my Daughter ^_^ Got the full package in the end. Unless games become available to download on the E-shop for it, it won't be worth the cost or price or time for me. I bought the other 3 labo kits when they went on clearance at Target and Walmart...$10 each was a good price then, but still haven't tried them yet, as it's the variety pack that I want to dive into. Other than that, spent the money on the PS4's VR, love it, but until there's more depth for this one (and more games that become available for it) it's not worth it to me. Looks fun, but I'd rather see an updated Pokemon Snap, or something else come out for it, and having to hold the thing up to your face the whole time, just feels like it's more of a chore than game play experience. Link's Crossbow Training VR when? That game still gets played on our Wii. It does get a touch more combat heavy towards the end, but I can see where it's a little slow for some people. When I explain the game to people, I do caveat that it is more of an "experience" and less of an action title - I just wouldn't call it a "walking simulator". I enjoyed the title, though I do wish I had played it headphones as the game suggests to get the full effect. Pro tip: binaural doesn't work with surround sound - no matter how high-end it may be. @NintendoFan4Lyf On Switch there's motion control support which is also a plus. @MattyHammo Nintendo basically gave up 3D on 3DS and doing it on Switch with these laborious kit. I enjoyed the video thanks @AlexOlney. Do you think there's any scope for using the Garage mode to edit the elephant software in a way that'll let you use an additional pair of joy-con to add movement around the subject? Also, @Nintendo, this desperately needs a way for user-made games to be shared. Otherwise, people are supposed to pour hours into creating VR games that none else will ever see....? @gcunit Only the 64 minigames were created with VR Garage. So you can edit those but not the main software for each toy-con. I wasn't really sold on Labo VR and mostly ignored it but now that I've watched this video, GameXplain's video and some of Alex's VR Garage stream (I really enjoyed watching his little fish game), it seems like there's some fun to be had. I'm not completely sold but I'm at least considering it. I'll at least wait until I know how well it works with other games. I really think LABO VR is doubling as a test for a full-blown VR add-on meant for a Switch revision/successor. I imagine a biker's helmet where you insert the tablet in its visor. Can you make Doom in this? Can you watch youtube vr videos with the goggles ? Hope games like thumper already available on psvr will eventually be patched to work on labo vr. The Nintendo website has expansion packs for certain VR games, so, I'll probably just pick up the starter pack and later maybe pick up the bird game (and fan pedal). I gotta play Zelda in Labo "VR"!